I got TDM output working! Here's a first commit. It implements 16 outputs, each 16 bits. For use with CS42448, the even numbered outputs end up as the 16 most significant bits and the odd outputs end up as the 16 least significant bits for each of its 8 channels. Theoretically, we could have 16 separate outputs, if some combination of chips in TDM most each listed to the right 16 of the 256 bit output frame. In this test, I had the same signal (from the Guitar synth example) connected to outputs 2 and 6. As usual, this first version is running with a non-optimized memory copy. Looks like running 8 of these memory copies is taking 77 us in the high priority DMA interrupt. Not wonderful, but ok for now. Hopefully this part will get optimized someday. Last edited by PaulStoffregen; 04-17-2017 at 01:46 AM. I've added code for TDM input. The AudioInputTDM brings in 16 channels, so all 256 bits of the TDM frame are available. For use with CS42448, the useful data appears as inputs 0, 2, 4, 6, 8 & 10. I also looked briefly at a datasheet for one of the TI chips which supports TDM. Looks like they expect the frame sync pulse during the first MSB, rather than the cycle before. 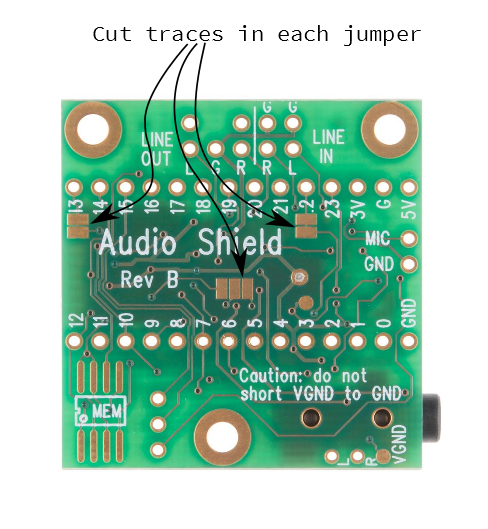 If anyone ever bothers to build up a board with more than 2 stereo TI chips, maybe the TDM code will need an option to generate the FS pulse 1 cycle later? I've published the PCB on OSH Park. Last edited by PaulStoffregen; 04-17-2017 at 09:03 PM. what is the meaning of "cut apart"? I have just read the article again and found the "cutting apart" thing. I am afraid that I blow the 2 audio adapters.. So what the meaning of "cut apart"? how should I do that? Does it make sense that the audio adapters were blown because not cut those traces? Last edited by alonper; 04-22-2017 at 10:50 AM. It's possible. Both may have tried to transmit on pin 13. But I'd suspect some other unknown error was made. While shorting those signals together isn't good, it usually doesn't destroy the chip. I have tried to upload a few examples to test the board. USBpassThrough -> while streaming audio to the teensy audio device no output from the 3.5mm jack. Audio streamed to the Teensy Audio Playback device --> no audio coming back from the Teensy Audio Recording device. It worked before the twicking.. I Just ordered a new audio cards.. hope to find out that the problem is not the Teensy3.2..
That program can not work. It doesn't have any normal input or output objects with "update responsibility". Add at least 1 instance of any other input or output. This quirk of the USB input & output is documented in the design tool. Look at the "Notes" section of the right-panel documentation. by the way the USBpassThrough also didnt worked..
To test your hardware, the synthesis examples like Guitar are best. They just send output to the headphone, regardless of settings on your PC. Those examples don't depend on a properly formatted & readable SD card. They don't rely on drivers or audio config settings on your computer, as the USB stuff does. Check your hardware first using the simple examples that don't depend on your computer to participate in creating the sound. USBpassThrough may be failing because your hardware is destroyed, or it might be simply a sound setting on your computer preventing audio from being sent to Teensy. All these in- and outputs look pretty amazing. Are there any things left to do (besides the memcpy) ? Tomorrow, I do some testing..
Last edited by Frank B; 04-24-2017 at 08:44 PM. Yes! I should admit, I spent very little time testing, especially the inputs. I'd like to design an application-specific audio mixer (for use in flight simulators, using an ethernet port for control), this looks to be exactly what I need. I've ordered your shared PCB from OSH Park (thank you) to experiment with, hopefully it won't be too difficult to solder up. 1. I'm wanting to minimize the input to output latency. If I edit the block size to less than 128, will AudioInputTDM & AudioOutputTDM continue to work? 3. Most of my audio objects will be mixers - does running mixer objects on Teensy 3.6 automatically make use of the hardware floating point for lower CPU usage? 1. ... If I edit the block size to less than 128, will AudioInputTDM & AudioOutputTDM continue to work? They haven't been tested at any other block size, but it should work. If you find a case that doesn't work, please remember to post complete code to reproduce the problem (aka "Forum Rule"). No, not at all related to latency. It means the input won't function unless there's at least 16 blocks free. It receives 16 channels in parallel, you know. No. The faster Cortex M4 DSP extensions are always used. The FPU makes 32 bit float almost as fast as regular integers. But the DSP extensions speed up a very limited class of integer operations. The audio lib uses integers, which are still slightly faster, and are significantly faster than floats in those special cases. please remember to post complete code to reproduce the problem (aka "Forum Rule"). It receives 16 channels in parallel, you know. This now seems entirely obvious. Consider me ashamed! But the DSP extensions speed up a very limited class of integer operations. Interesting, I'll have to read the documentation on that out of curiosity. "level" may be any floating point number from 0 to 32767. 1.0 passes the signal through directly. Level of 0 shuts the channel off completely. Between 0 to 1.0 attenuates the signal, and above 1.0 amplifies it. Last edited by macaba; 05-04-2017 at 10:30 AM. Numerically speaking, yes you can. Of course that's pretty useless since any signal more than 0 goes right to the clipping limit. Likewise, there are many floating point numbers you could use very close to zero which actually round down to zero due to numerical precision of the 32 bit integers used within the mixer object. Is there any audio library developer documentation out there? I'm making a 'AudioMixerCrosspoint16' object that will mix 16 input signals to 16 output buses. I've used AudioMixer4 as my template but that only deals with 1 output stream so I'm unsure how to add more output streams. Last edited by macaba; 05-04-2017 at 02:10 PM. Thank you Paul, I got it working and added it to the Audio System Design Tool too (on my fork). Brief testing shows it works, I'll be able to do further testing once I've got a TDM board. Edit: Spoke too soon. More testing required here. Last edited by macaba; 05-04-2017 at 11:11 PM.